Keeping your tires inflated is a pretty basic need while mountain biking, but it comes with several challenges. There are two potential valve standards, the valve is tucked between spokes, you have to carry this device with you in order for it to be useful and last but not least, you don’t want to spend your entire riding time inflating your tires. 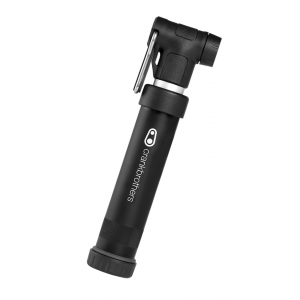 We’ll be looking at the Lezyne Sport Drive HV hand pump to see how it stacks up to all of these challenges. The Lezyne Sport Drive HV takes on the challenge of keeping your tires inflated while on the go with a clever design. 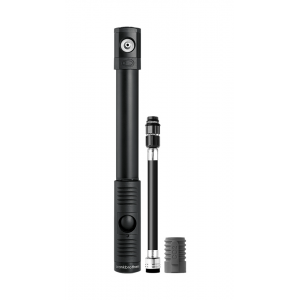 Unlike many mini pumps that feature a valve head attached directly to the barrel of the pump the Lezyne Sport Drive HV features a separate hose hidden in the body of the pump that attaches to your valve and to the pump. This mini hose is reversible to allow connection to both presta and shrader valves. 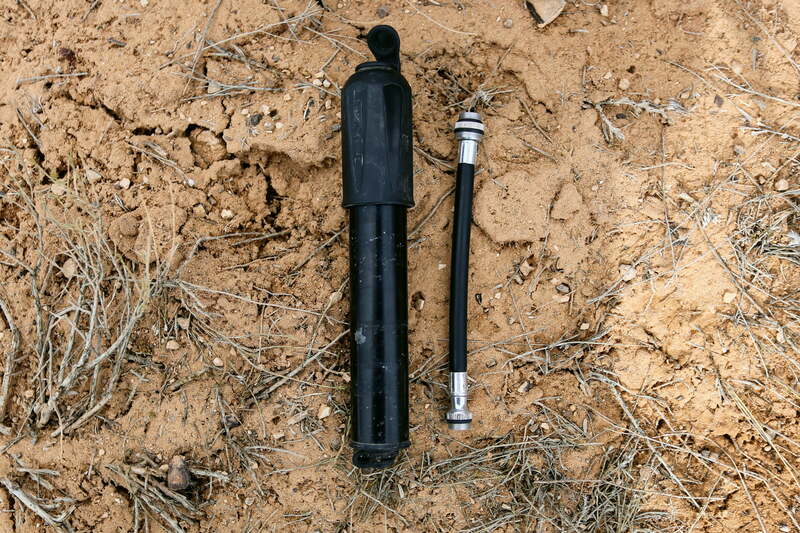 The flexible hose also reduces any lateral pressure on the valve stem while using the pump. This is really a key feature in my mind as the last thing you want to do while inflating your tire is bend or break a valve stem. The HV, in “Lezyne Sport Drive HV” stands for, high volume. 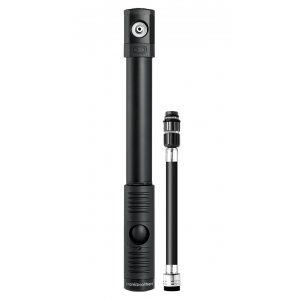 Lezyne sells both high pressure and high volume versions of its pumps. The HV version is better suited to mountain biking as the volume of tires is high while the pressure remains relatively low. When I got the Sport Drive HV I was a little concerned that it would be inconvenient to use since I needed to connect a hose and screw it on, on both ends in order to use it. In reality, this hasn’t been an issue at all. Of course this is not the ideal tool for a race situation. But, for everyday use the Sport Drive HV is by no means inconvenient. I must say I actually prefer the security of the hose being screwed to the valve stem instead of being attached by a more traditional chuck. Another major concern with mini pumps is that you’ll end up spending half an hour crouched on the ground furiously attempting to get enough air into your tire. The Sport Drive HV claims to do a better job than traditional pumps at inflating high volume mountain bike tires. I took my 29″ Maxxis Ardent 2.4 and tried inflating them from zero pressure up to 20PSI. It took about 250 pump strokes, but those pumps are small and I was able to get the tire re-inflated to a riding pressure in under 5 minutes. The Sport Drive HV itself features a metal body with plastic used for some of the small parts. Included with the pump is a waterbottle cage mount. I find the cage mount to actually be very useful. I like having the pump attached to my bike and I never have to worry if I remembered my pump. Both ends feature rubber caps that work well for keeping mud and gunk out of the internals. I’ve been very happy with the Lezyne Sport Drive Hv and for the price I don’t think you can go wrong. It would be nice to have a pressure gauge and it could be faster to get connected, but overall I really like this pump.